March 31st was Riley’s 3rd birthday and we celebrated on Sunday the 30th with a family get together. 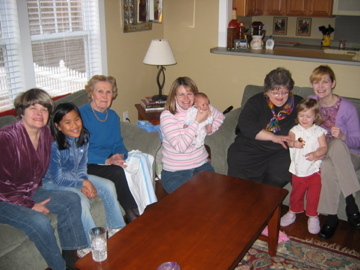 (L to R: Maureen, her daughter Megan, Great-Grandma Margaret, Elizabeth and she is holding Jack-Jack, Patty, Riley and me.) You’re probably asking yourself where are all the boys in the family? Well, for the longest time there hasn’t been a male born in the family. But thanks to Jim and Elizabeth they have broken the all-girl spell by having Jack. We are all thrilled! I know Daddy is smiling down from heaven on us and he’s especially happy because his great-grandson has his name. Here is my latest project or the project I keep looking at on my design wall and saying to myself…”what can I do with this?” I think I’m going to add the stems and leaves, a small border and bind it. I have a beautiful hanger that is about 12″ long that I can hang it on. Now I need to figure out where to hang it in my house.